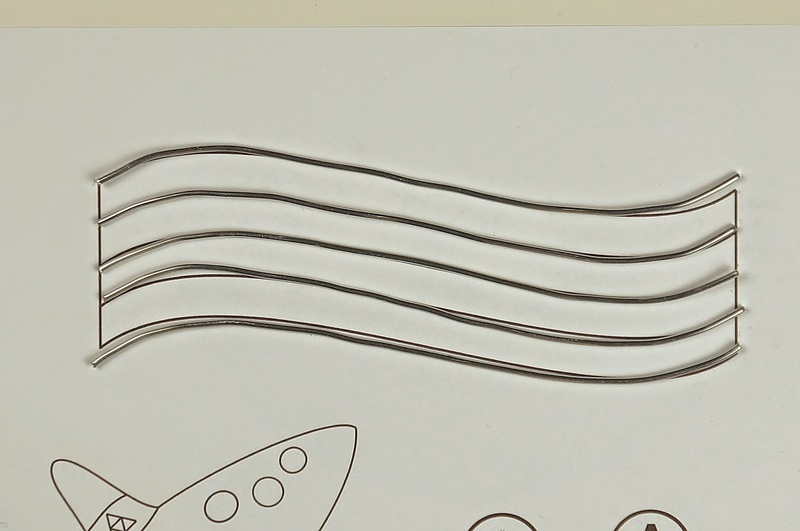 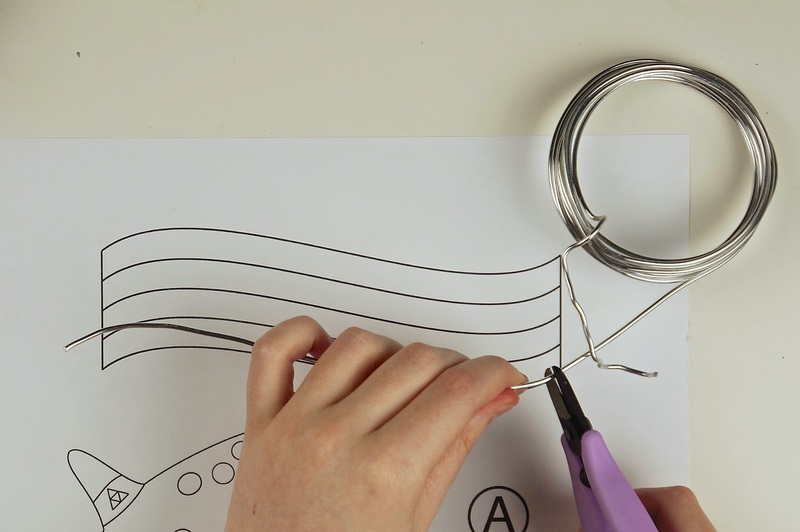 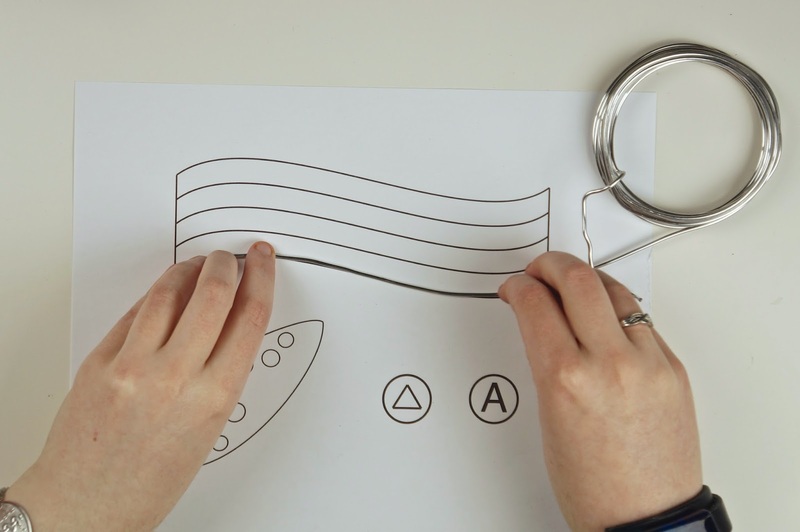 Straiten your wire and cut to the length of the music bar ends (again, use your template as a guide). 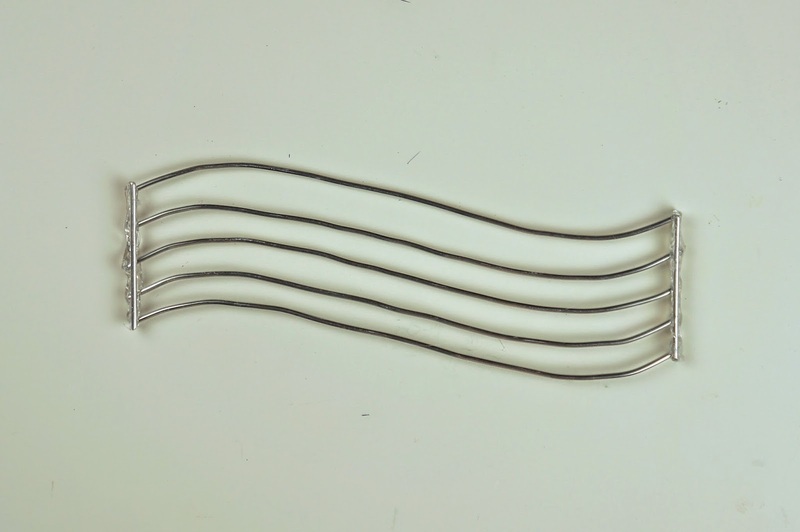 Cut 2 wire bars for each end (4 bars total). 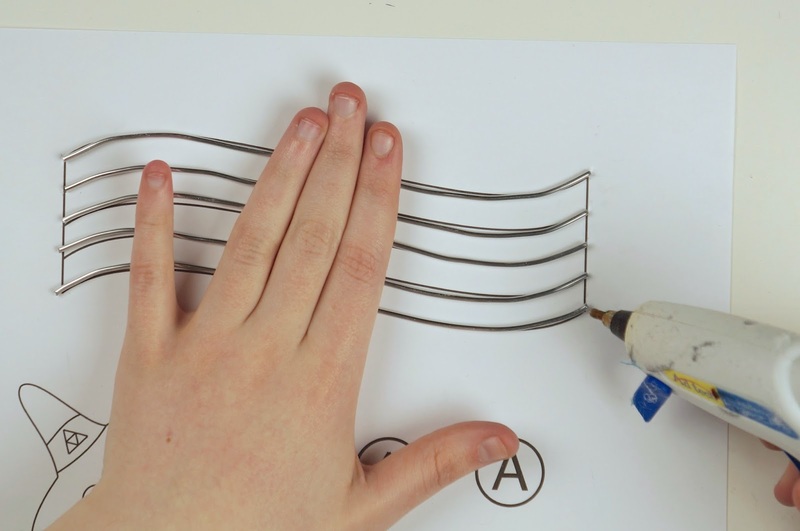 Line up your horizontal bars on top of the template, hold in place with one hand and dot glue onto the ends of each bar. 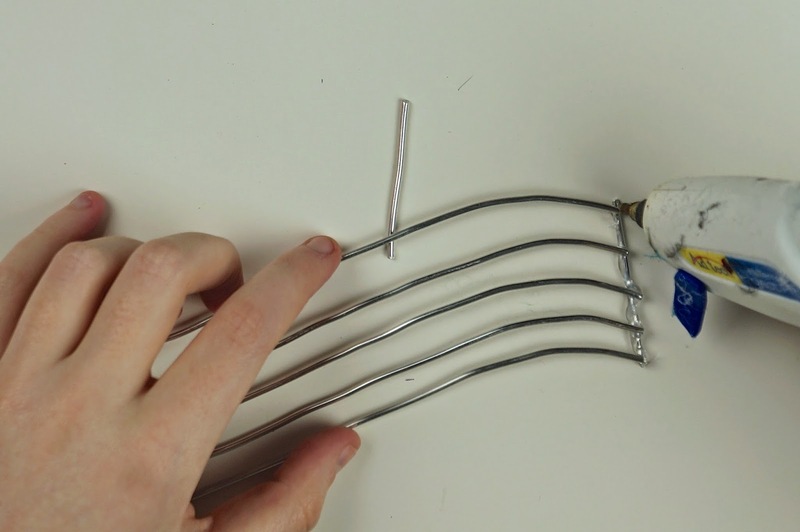 Place one of the end bars onto the gluey ends. 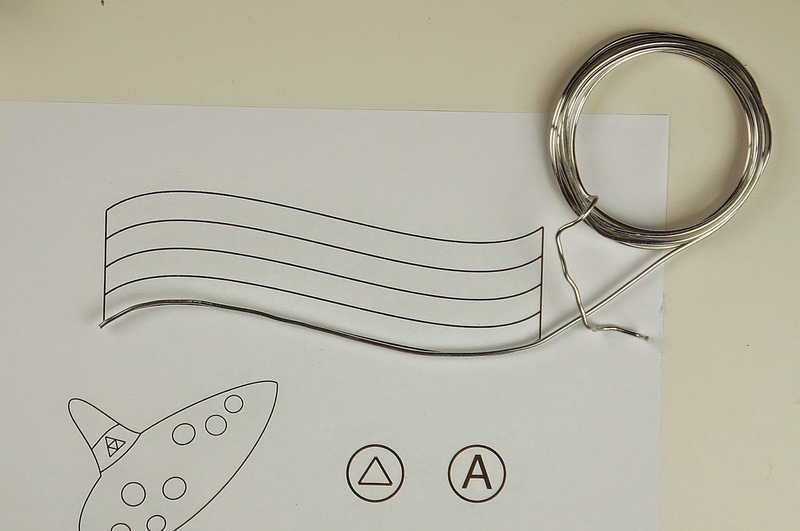 Repeat for the opposite end then flip your ornament over and glue the other 2 end bars to the backside. 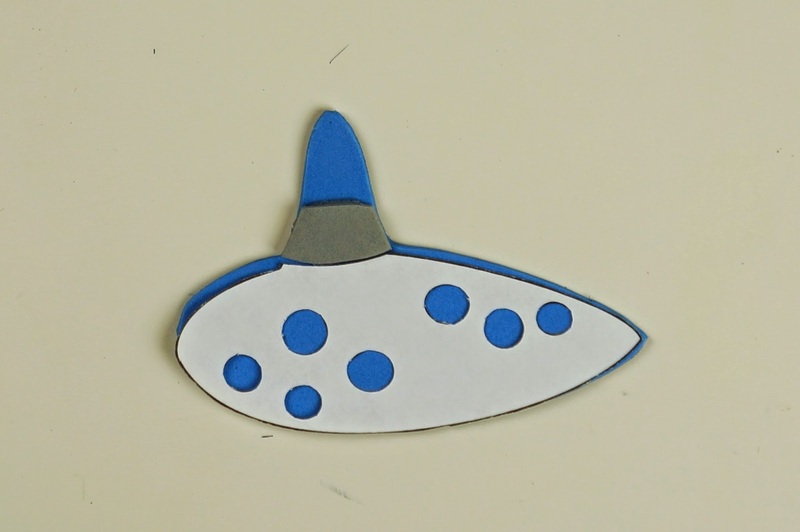 Cut out the other parts of the template (the ocarina and music buttons). 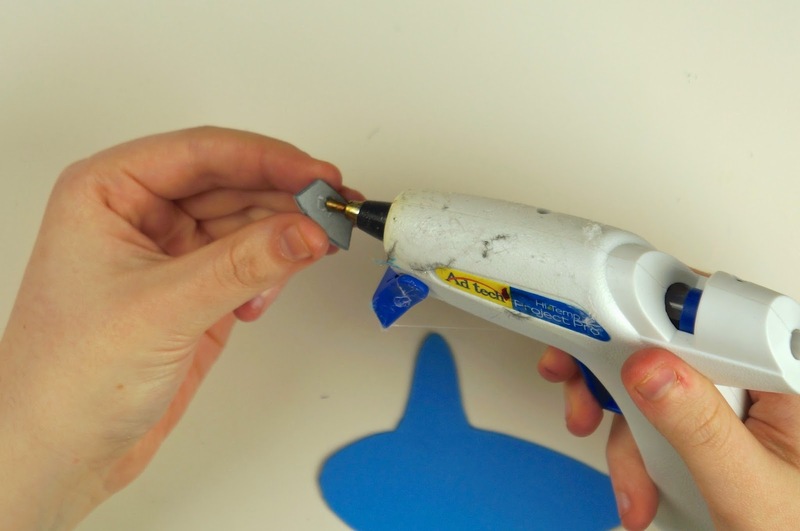 Trace the ocarina template onto your light blue foam. 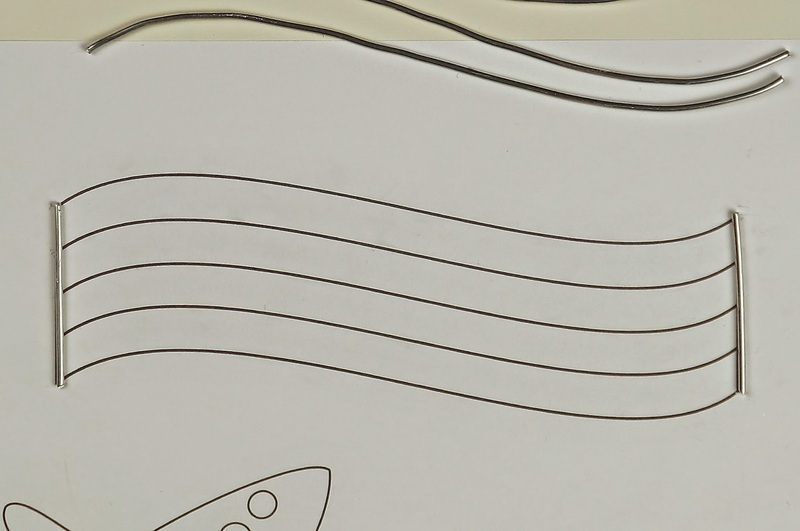 You might want to flip the template over so you won't see any pen/pencil lines on the finished ornament. 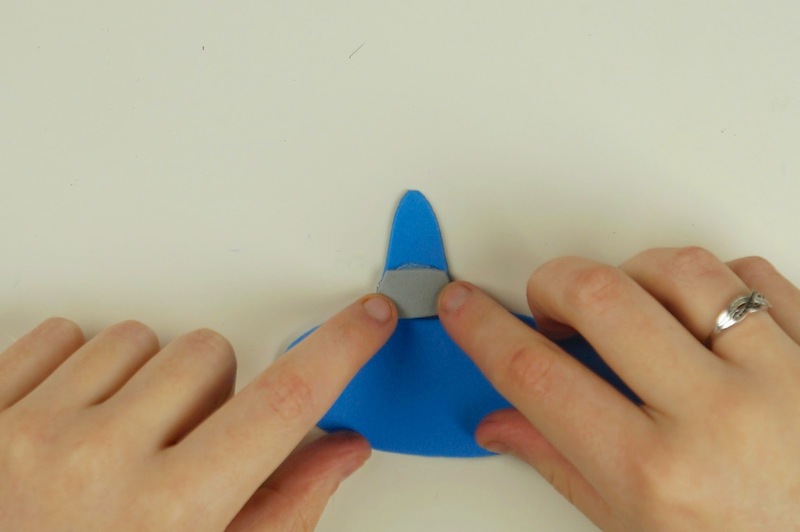 Then cut out the foam ocarina. 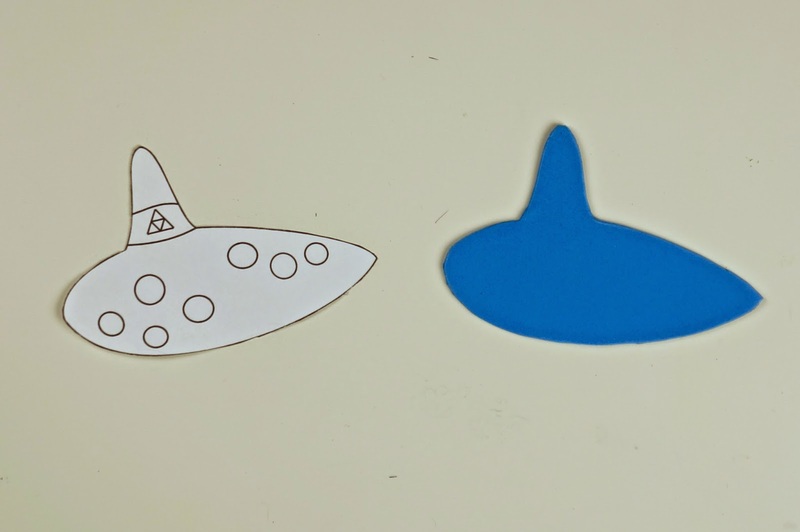 Cut out the Triforce band from the ocarina template. 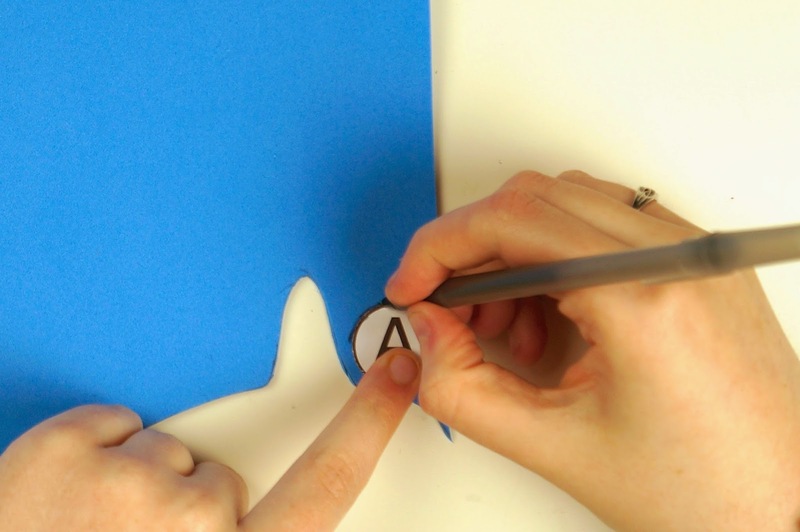 Trace band onto grey foam then cut out. 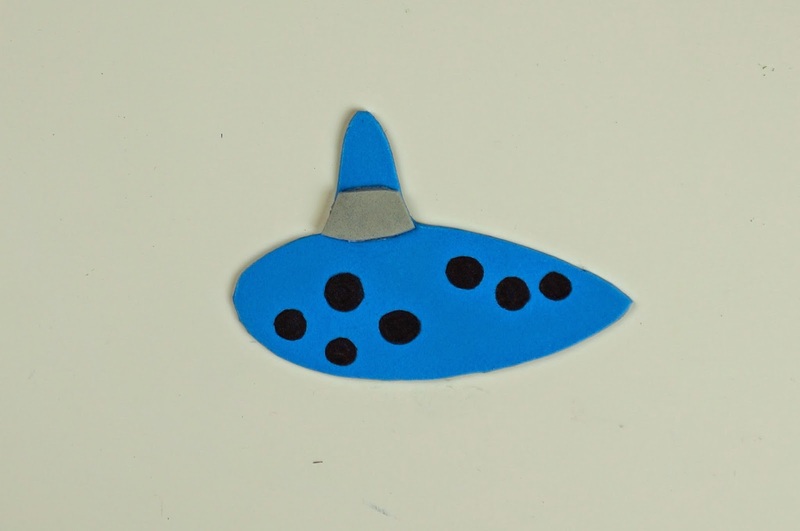 Glue grey band onto the front side of the ocarina. 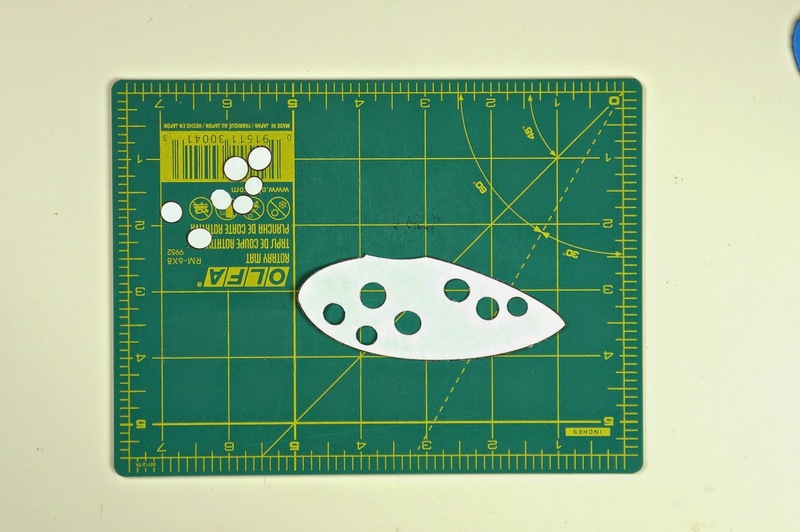 Cut out the ocarina holes from the template. 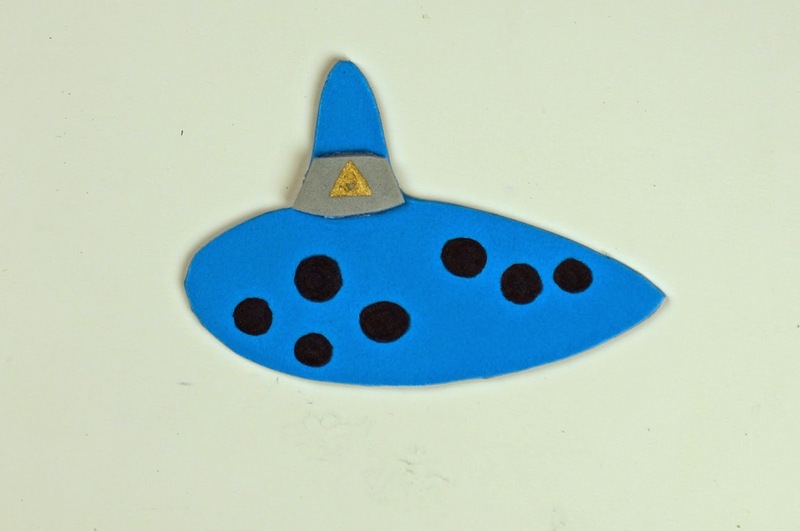 Place cut out ocarina template onto the front bottom portion of the foam ocarina. 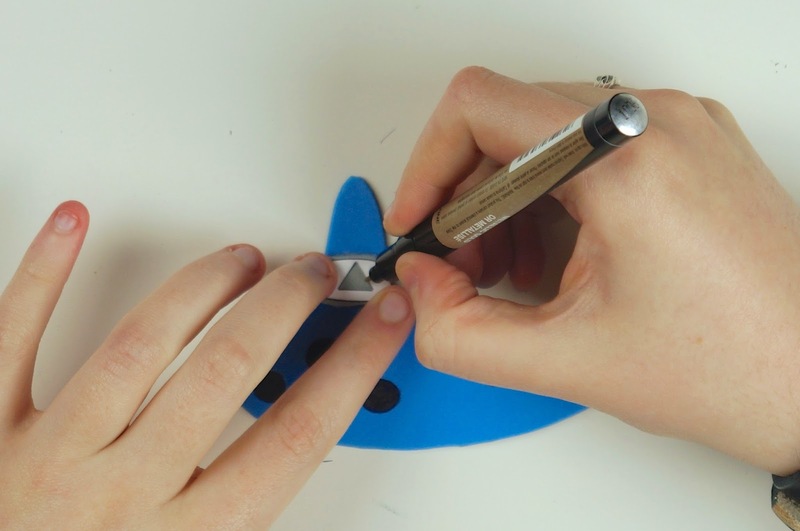 Trace and fill in the ocarina holes using a black permanent marker. 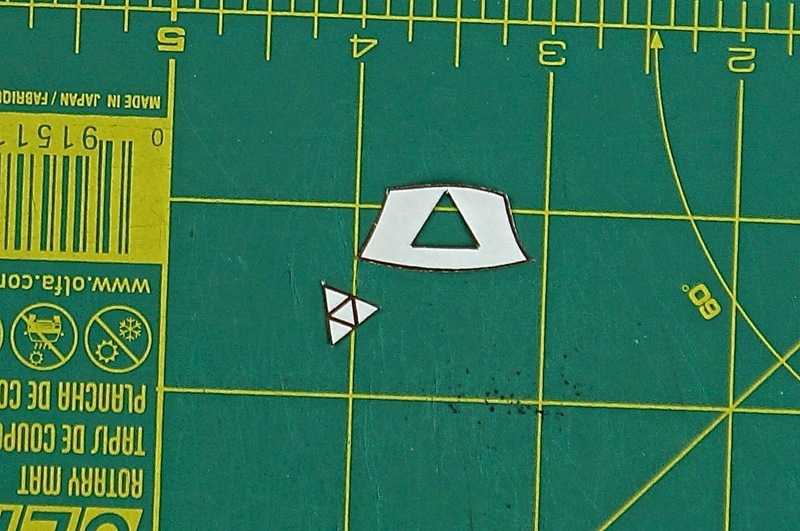 Cut out the Triforce from the band template. 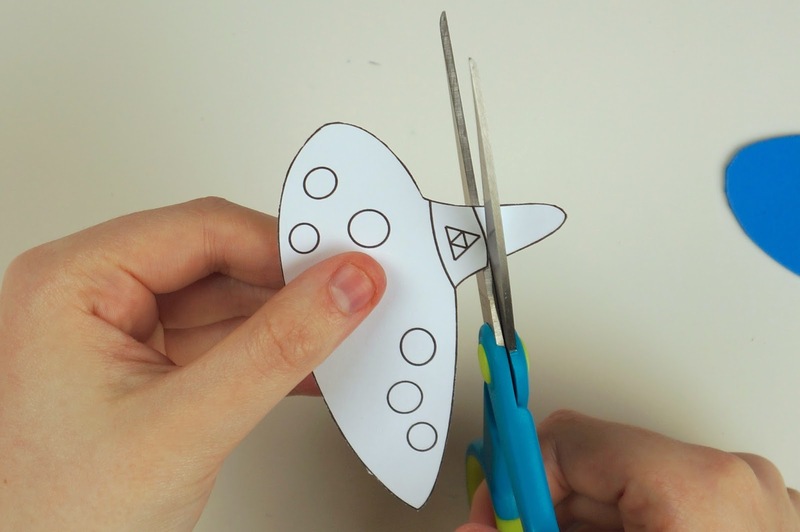 Place cut out band template onto the grey foam band. 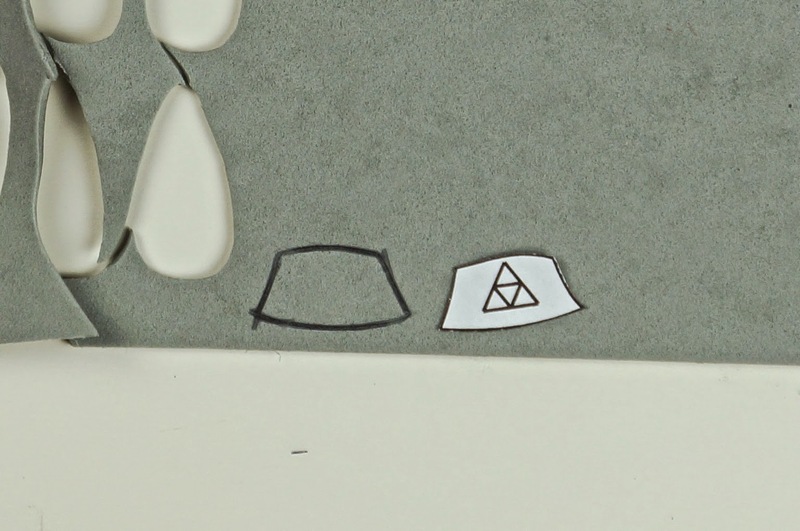 Use the template to help you with the size/placement of the Triforce. 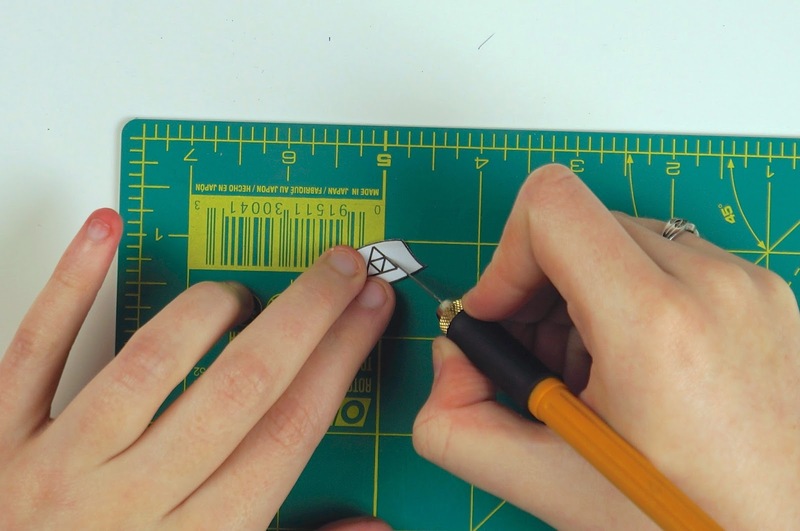 Draw on Triforce using a gold permanent marker. 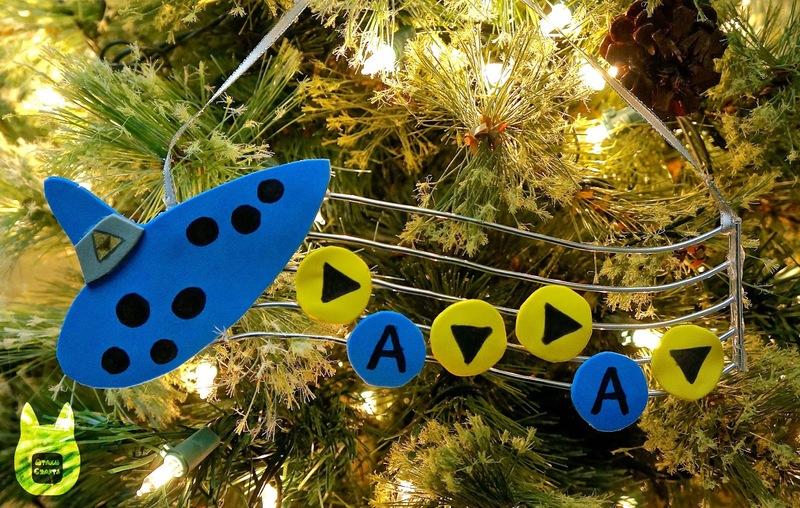 Decide on which ocarina song you want to have on your ornament. 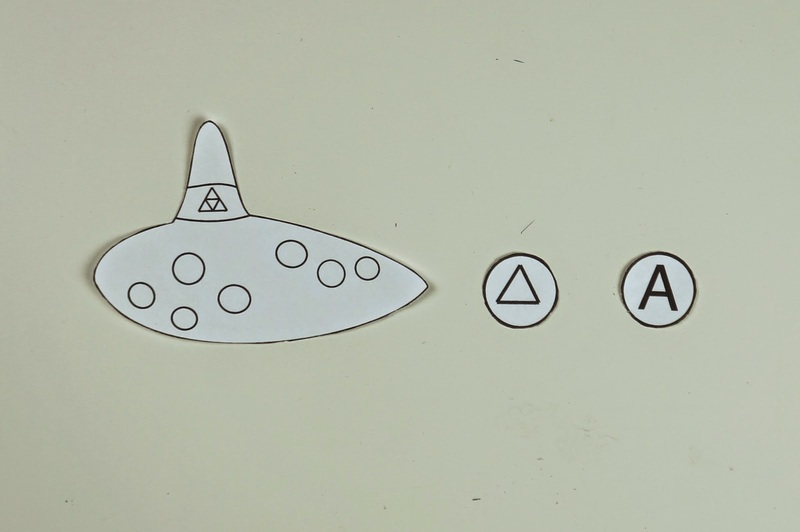 We'll be doing the Song of Time. 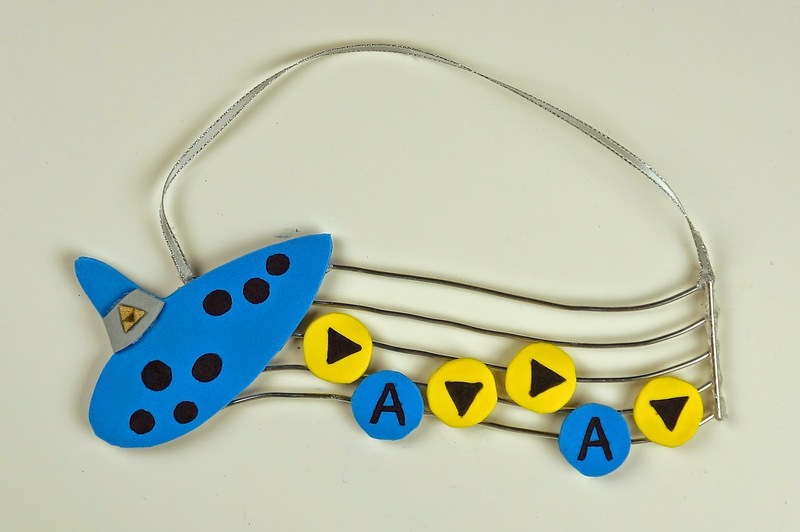 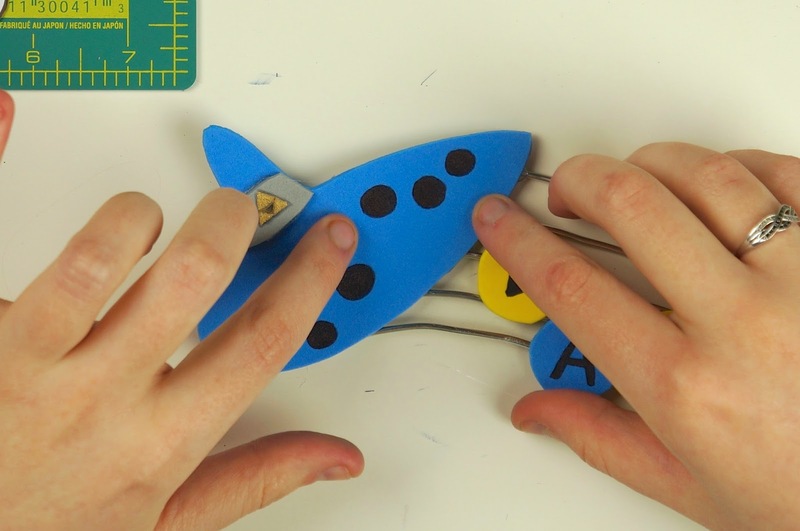 Trace the appropriate amount of arrow music notes for your song onto your yellow foam and A button music notes onto your light blue foam (4 arrows and 2 A buttons for the Song of Time). 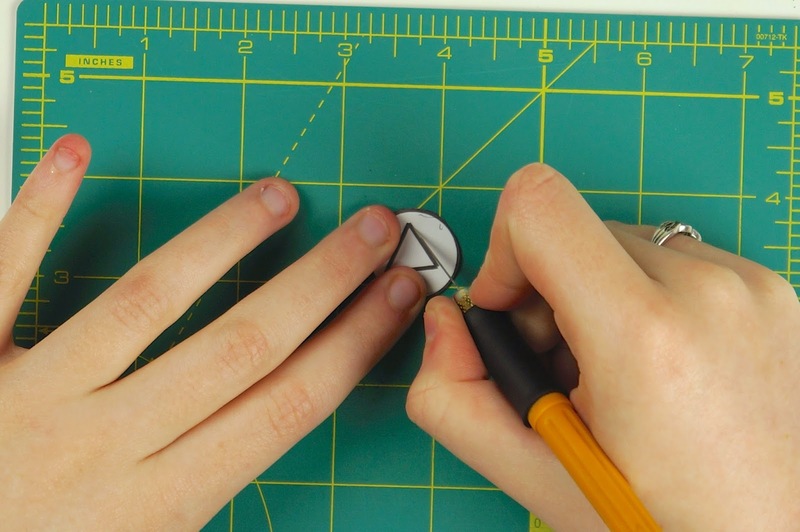 Once you have all of your music buttons traced, cut them out. 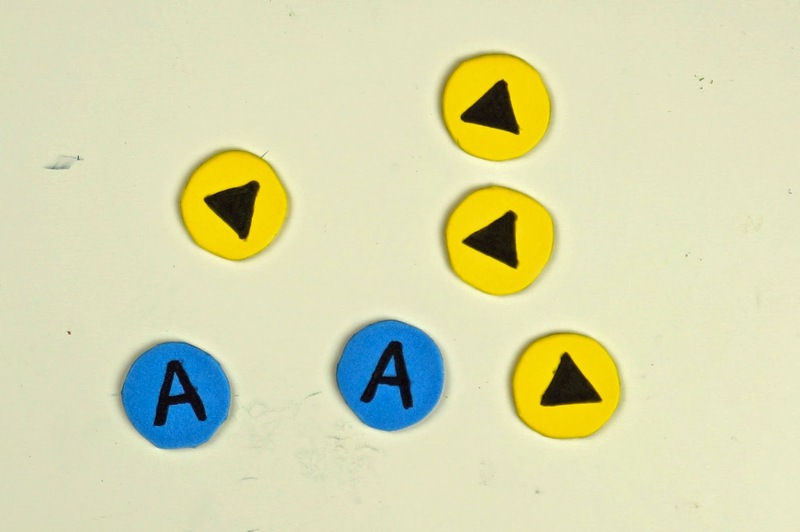 Cut out the arrow and "A" from the music button templates. 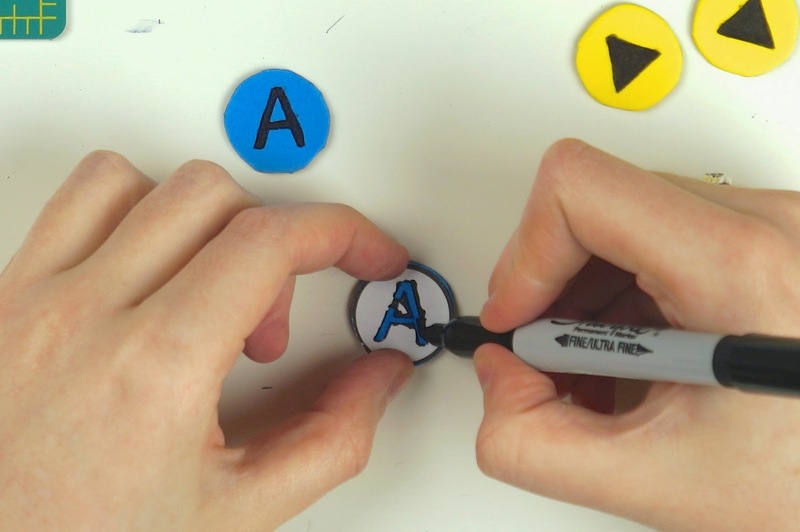 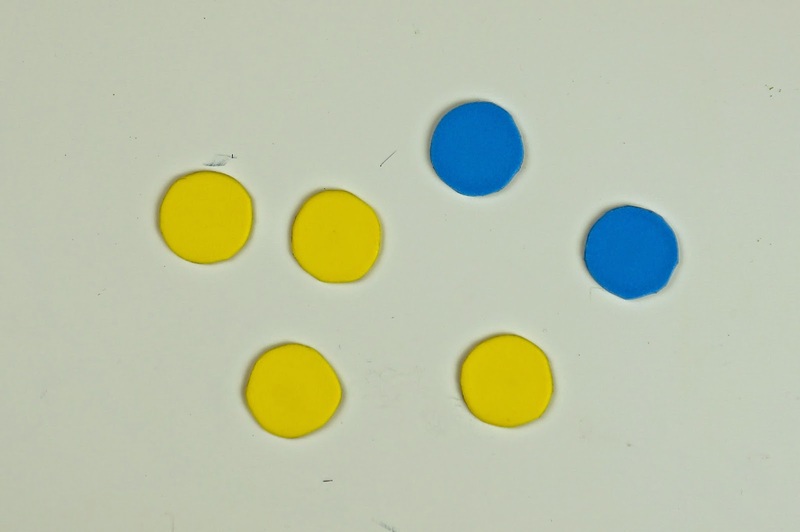 Place your music button templates onto your foam circles (arrows on yellow, A's on blue). 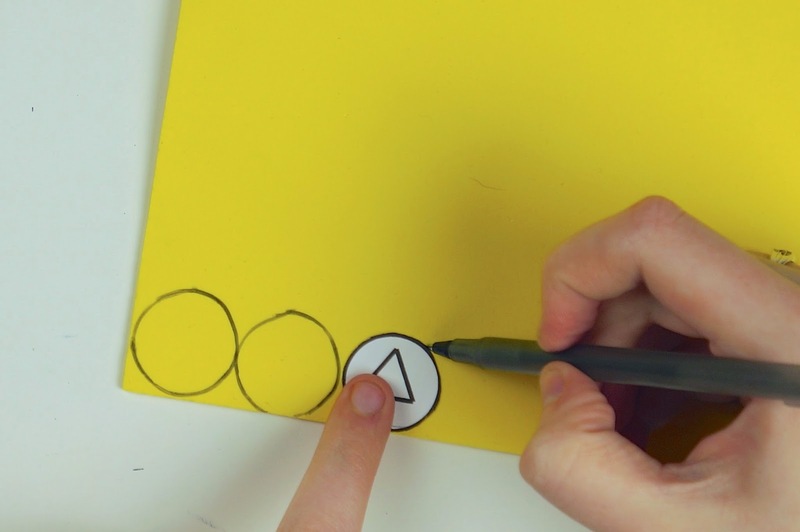 Trace and fill in the symbol using a black permanent marker. 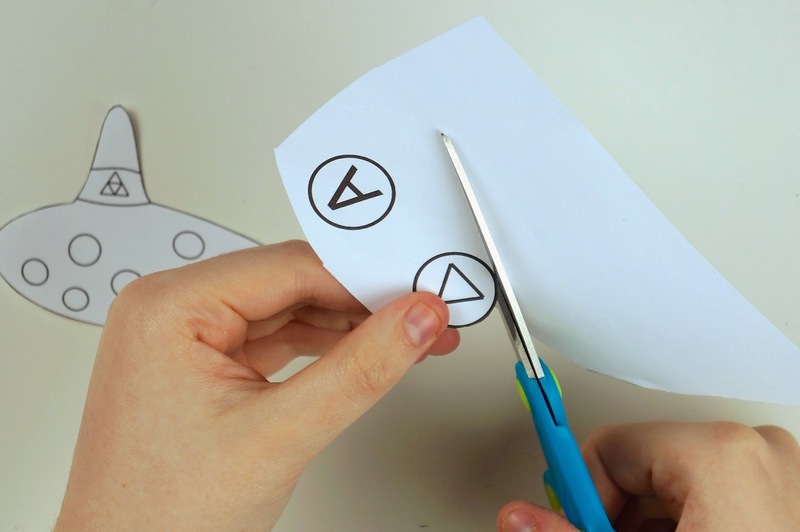 Do this for all of your foam circles. 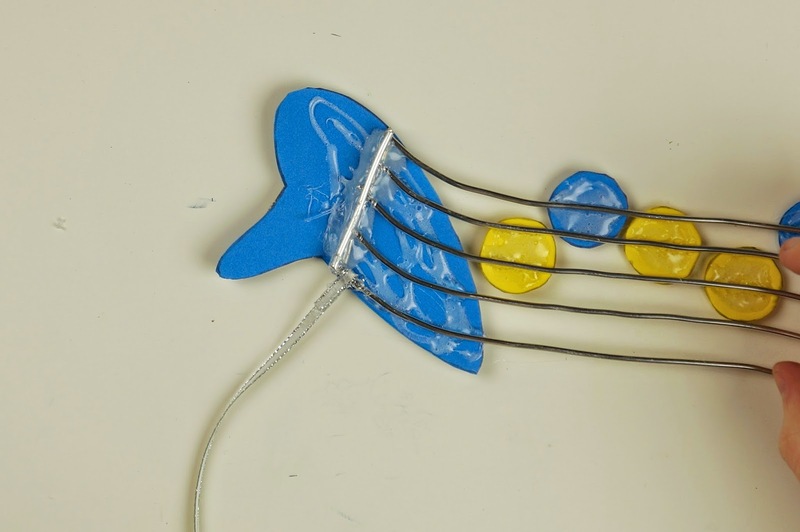 Glue your music buttons and ocarina onto your wire music bars. 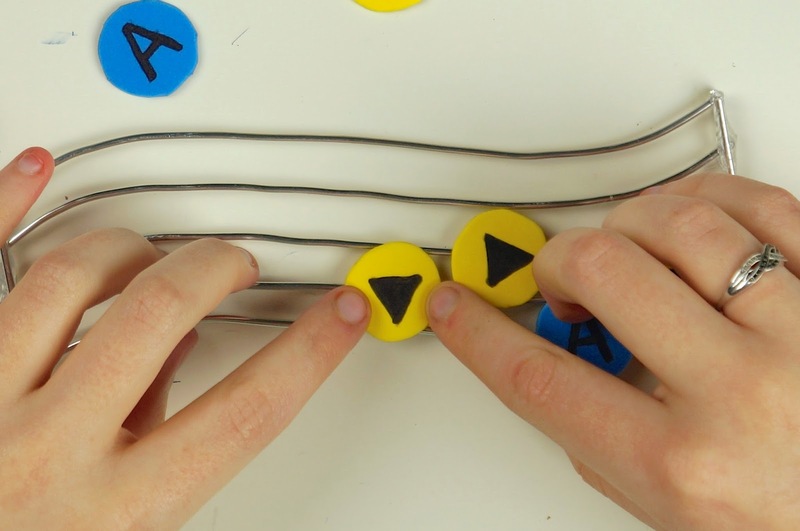 Make sure to glue the music buttons in the right order for your song, on the right bars and have the arrows pointing the right ways. 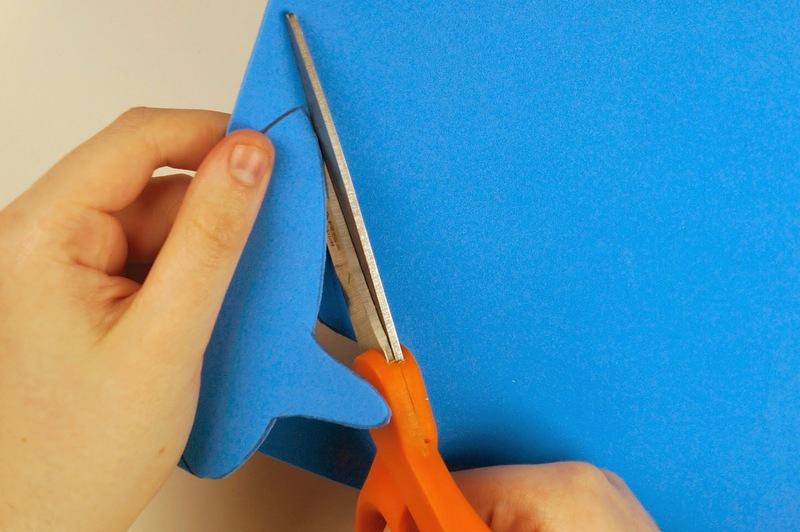 Cut a length of your ribbon. 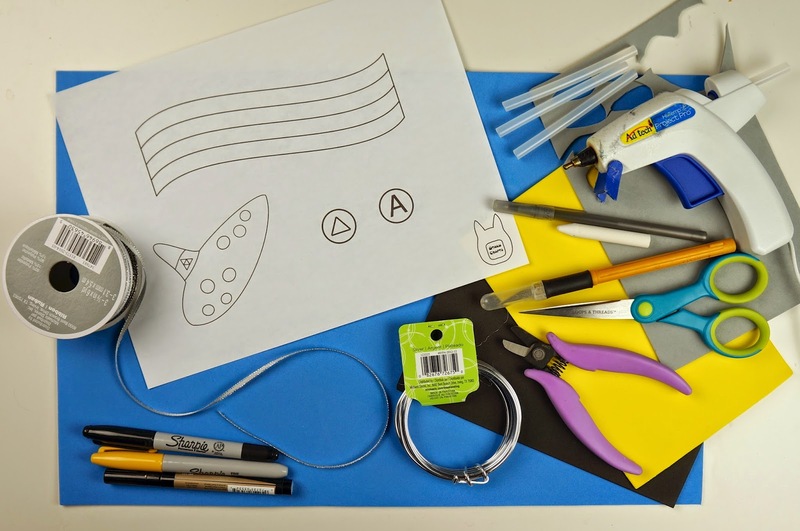 Wrap one end of the ribbon around the top bar behind the ocarina. 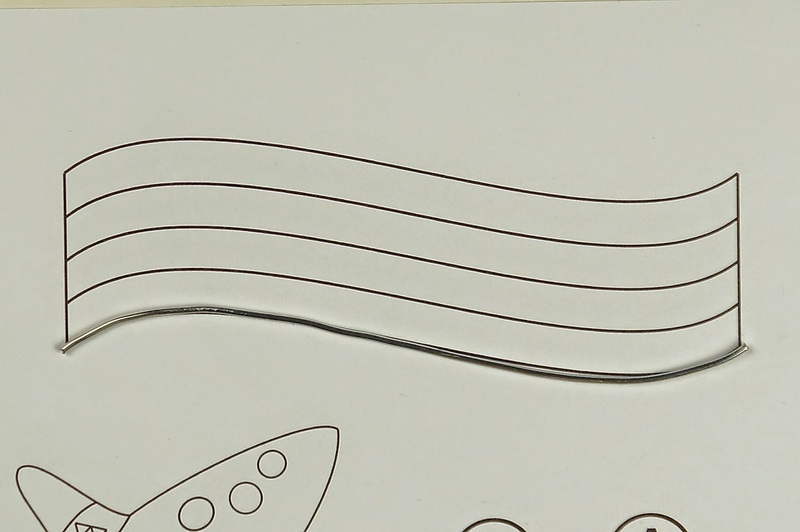 Hot glue/tie the ribbon in place so that it doesn't slide on the bar. 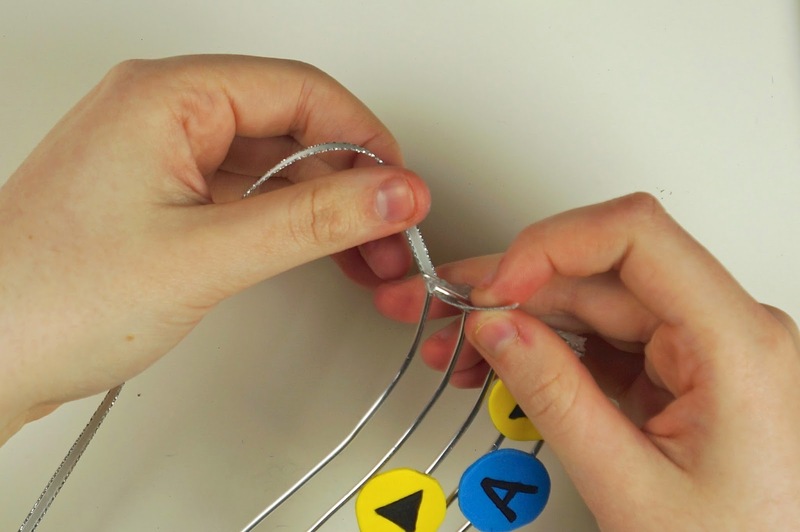 Wrap the other end of your ribbon around the end of the music bar between the top two horizontal bars. 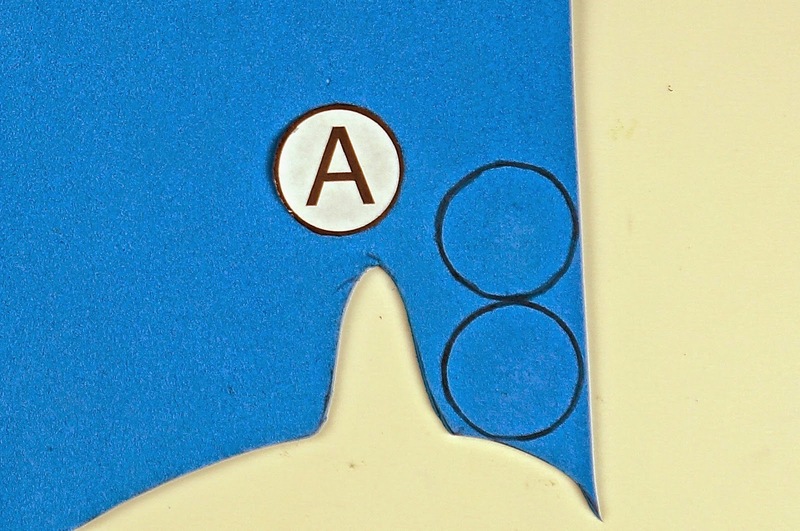 Hot glue/ tie in place. 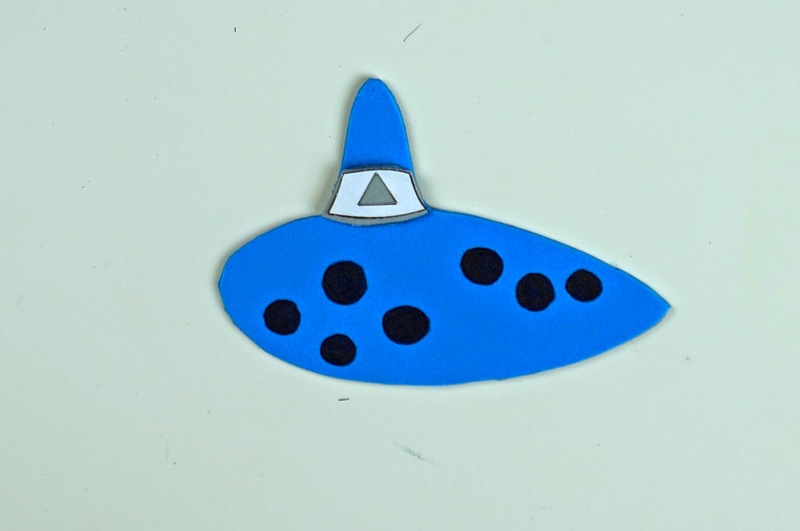 Now you have your finished Ocarina of Time music ornament!